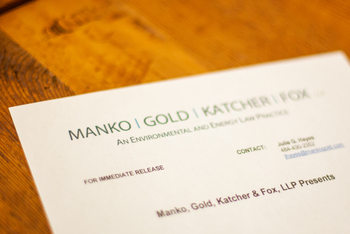 Carol F. McCabe, a partner with Manko, Gold, Katcher & Fox, LLP (MGKF), the environmental, energy and land use law and litigation firm based just outside of Philadelphia, PA presented "Evaluating Facility Changes Against Potential NSR Triggers - Is It Growth, Efficiency, Debottlenecking, or Merely Avoiding Breakdown?" as part of the Annual Meeting of the Food & Beverage Environmental Conference (FBEC). Her presentation took place Tuesday, March 24 at 8:00 am at the Grand Hotel Marriott in Point Clear, AL, and was focused on New Source Review air permitting issues.